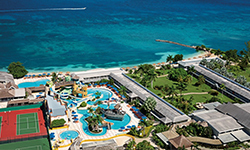 Located on a secluded peninsula in Montego Bay with over 1,800 feet of powdery beach and overlooking the Caribbean Sea, Sunscape Splash Montego Bay offers guests a fun-filled getaway with all of the privileges of Unlimited-Fun®, where everything is included, with traditional Jamaican hospitality. Whether it’s gliding down waterslides, riding a pirate ship or just relaxing on a lazy river at Pirate’s Paradise Waterpark, there’s fun for everyone! With our Unlimited-Fun® guests will enjoy 24-hour access to food and beverage options, with a buffet and à la carte restaurants serving a variety of cuisine and kid-friendly menus, 24-hour front desk service, along with endless domestic and international beverages from fun bars and lounges and more, all without wristbands or reservations required. The Explorer’s Club provides kids, ages 3 to 12, daily programs and fun activities with Red Cross-certified supervisors. Plus, Sunscape’s family-friendly program will also include a kid’s check-in experience with red carpet stairs, welcome treats and resort passports for kids, spacious connecting rooms, the Core Zone Teens Club for ages 13 to 17 and more! Remarks: "Land Only” prices are per person and include accommodations based on double occupancy (unless otherwise stated), hotel taxes and r/t airport/hotel transfers. Restrictions, blackout dates and surcharges may apply. Prices are subject to availability and change. $10 late booking fee applies if applicable (for bookings within 14 days of departure). Some all-inclusive/Unlimited-Luxury/Unlimited-Fun resorts do not include watersports. Valid for booking through 1/4/2019 for select travel 2/18/2019 - 3/31/2019.